I’d planned to write about each batch as I made it to help myself retain any lessons learned for future reference, but you get to a stage where you realise you’ve been focusing on unimportant or uninteresting details. In hindsight, one of the biggest hurdles to overcome is separating the considerations that are important in making a good beer from the considerations that really don’t have much of an effect. A good example of an important detail I forgot throughout this year was listing precise ingredient amounts for if I wished to follow the same recipe again. I made a section per batch below, listing any new equipment I was using and processes I was trialing. I made this first batch using a Mangrove Jack Fermenter kit and the wort pouch that came with the kit. The beer was a little estery due to inefficient cooling of the fermenter in the January heat. I was using an un-insulated swamp cooler (wet towel draped over the fermenter). Still it was nice enough to enjoy. I poured finings in at the end of fermentation to make the beer appear clear rather than cloudy. Finings are made of gelatine, however, meaning the beer is no longer vegan. I followed online guidance rather than the recipe on the kit, meaning fermentation took about twice as long. Given the poor temperature control it really should have tasted worse. Not a lot of complexity to the flavour but then its just a basic lager brewed like an ale (lagers are fermented and conditioned at low temperatures while ales are not). I focused heavily on unimportant details a lot but then that’s what you do when you’re learning on your own. I forgot to measure the starting gravity so the alcohol content was unknown. Woo! A swamp cooler isn’t enough on its own for a Brisbane summer. Insulation and ice-packs cycled every 12 hours are a minimum to keep the temperature below 22c. I should take more notes and photos to keep a better record of what I’ve done, to refer to later when I have time or if something goes wrong. The photos don’t need to be well lit or composed. The point is to capture relevant information, like a starting gravity with a timestamp. Remote monitoring of temperature would be a lovely thing. When you come home from work you have no idea what temperature it got to in the middle of the day. Finings aren’t a great idea. Its basically a gelatin powder used to make the beer clearer in appearance and doesn’t at anything else. There are other ways to reduce cloudiness while keeping the beer vegan-friendly. 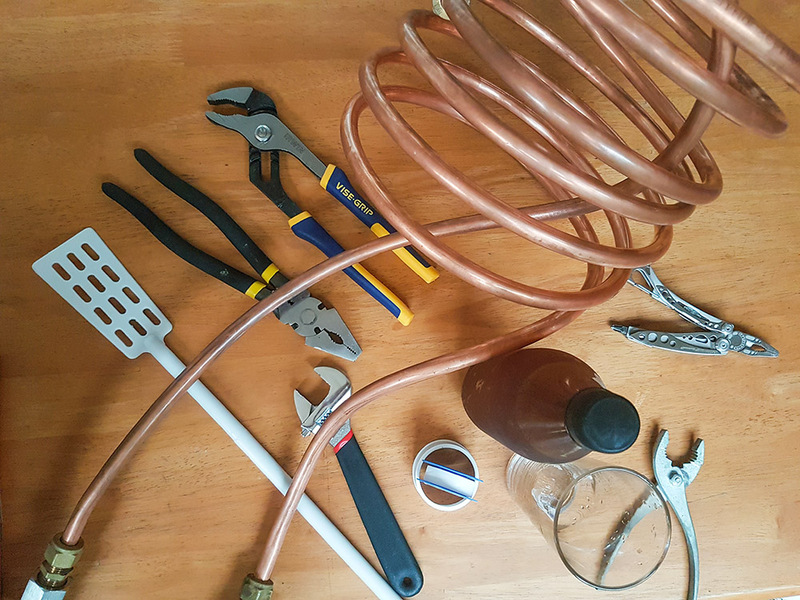 The instructions on the kit will show you how to make beer fast, but basing your technique on what you learn in the community will make your beer better. I ignored the instructions and went with information I found online and was better for it. 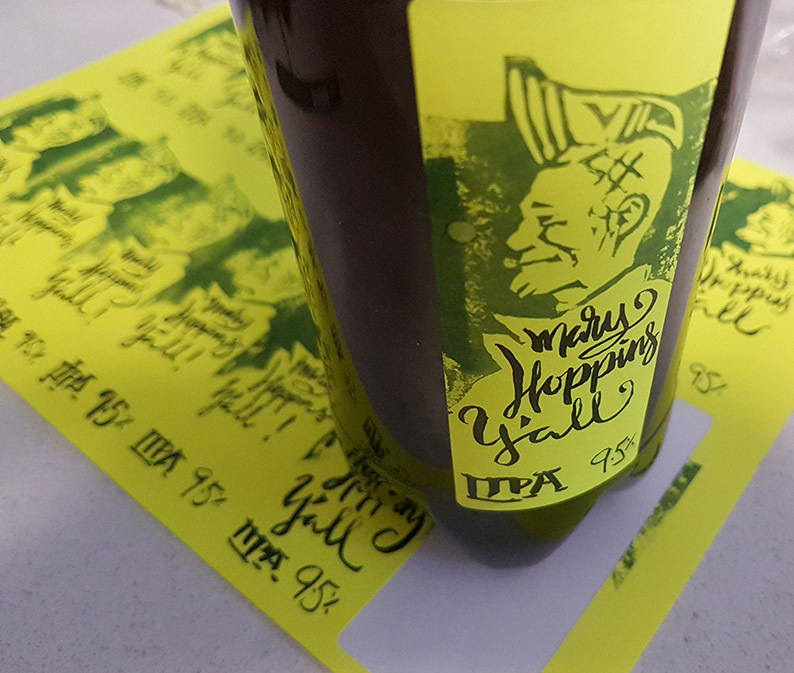 I left the beer sitting on the trub and dry hopped for way too long and the beer was very estery and quite astringent and unpleasant as a result. It took a while to finish this batch off, as beer made before and after tasted a lot better. I forgot to measure starting gravity, so alcohol content was (again) a total mystery. Don’t store beer in the fermenter. Once your work is done, bottle it in a timely fashion so it can mature away from the trub. This is one of the reasons people use secondary fermenters to do things like dry-hopping. 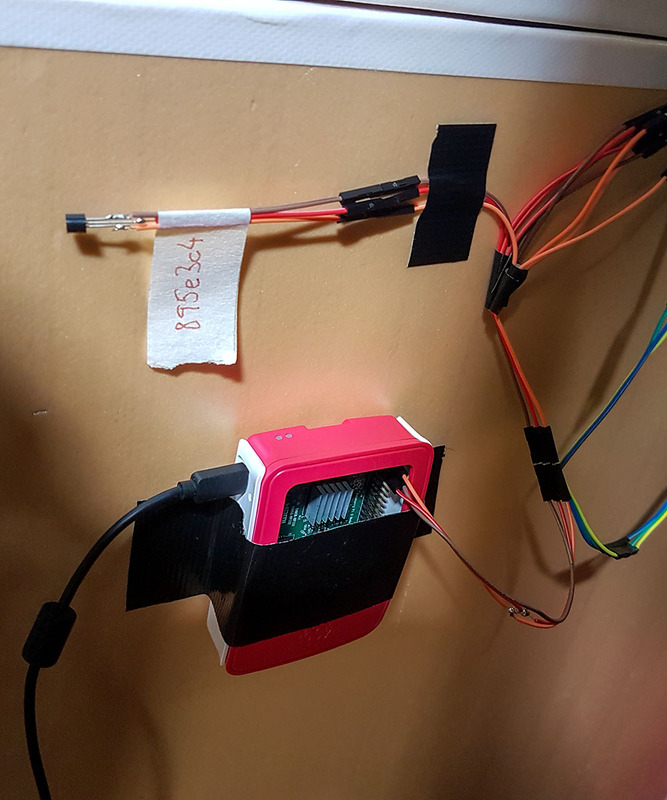 Raspberry pi with exterior thermal sensor marked. The other wires run to sensors inside the cooler box and against the fermenter. The last batch went so badly when I’d been expecting something really nice. Wanting to just feel good about brewing I though I’d skip uncertainty and just ferment a fresh wort straight up and see how it tasted with my method of fermentation control. I bought a Tilt Hydrometer to avoid dealing with the kludgey temperature monitoring system I used previously. We picked up a 15L concentrated container of Wort from Brewer’s Choice, who informed us that The Catchment in West End made it for them. I took it home, emptying the 15L into the fermenter and topping it up with 5L of tap water, before pitching the yeast at 26C. I then dropped in the shiny new tilt hydrometer, which did a great job. Dry hopped with 20g of Cascade on day 6, after fermentation flatlined. The outcome was really lovely and just what I’d hoped for. 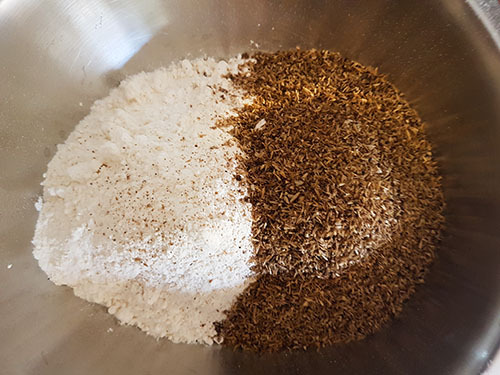 This was my first foray into all-grain brewing – where you take the basic cracked grains themselves and brew your beer from that, rather than starting with the liquid made from these grains. I bought a Crown boiler from National Homebrew, and they were kind enough to send a free grain kit to kick things off. 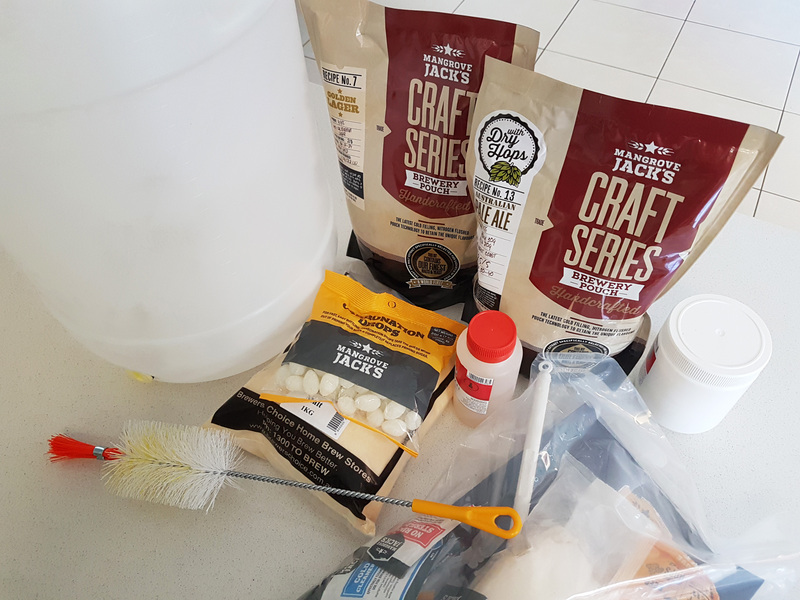 I selected a pale ale that seemed nice, got all my kit together and started brewing all grain for the first time. This was to be a clone of the Pale Ale “150 Lashes”. I had yet to learn about the quirks of this boiler however, and in the process of figuring things out I bodged the boiling process pretty badly, leading me to rename it after what I assumed the fermented beer would taste like. 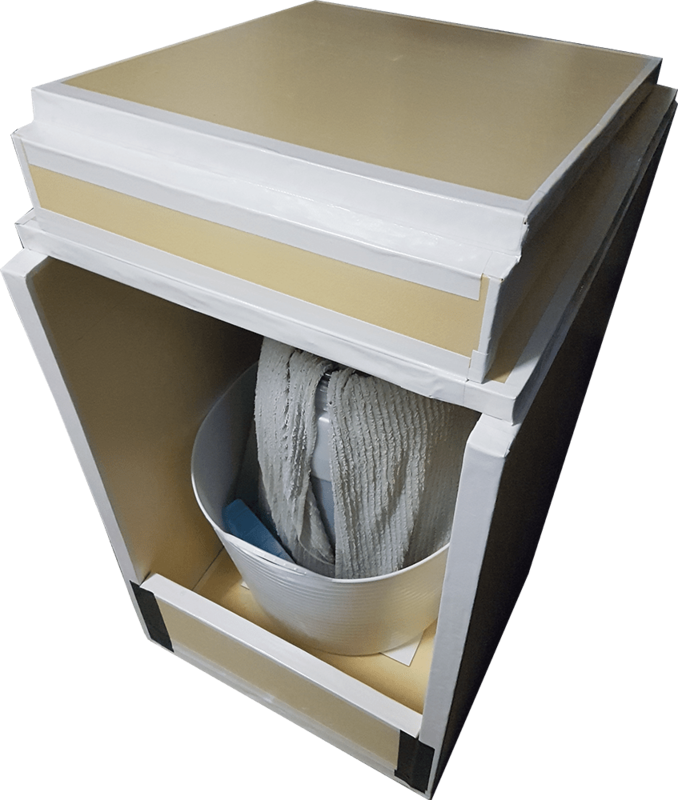 The boiler has a protected heating element in the base, along with an exposed temperature sensor which has a small perforated hood to prevent it getting knocked off. 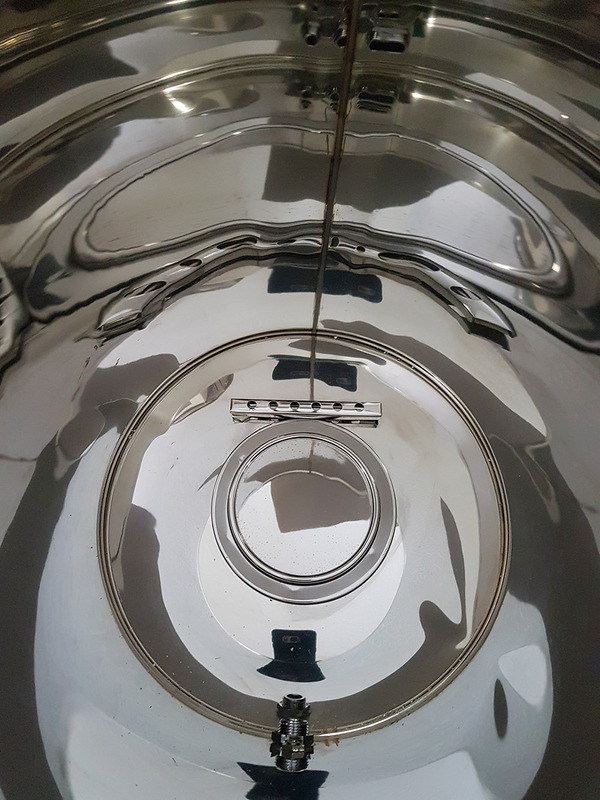 The strainer-like plate that comes with the boiler prevents the grain bag from ever coming into contact with these elements. That’s good! The strainer also prevents the liquid below it from being circulated as thoroughly as in the rest of the boiler. That’s bad! Having added my grains to the water, sediment fell through the grain bag to the bottom of the urn. Quite a bit of it, in fact. 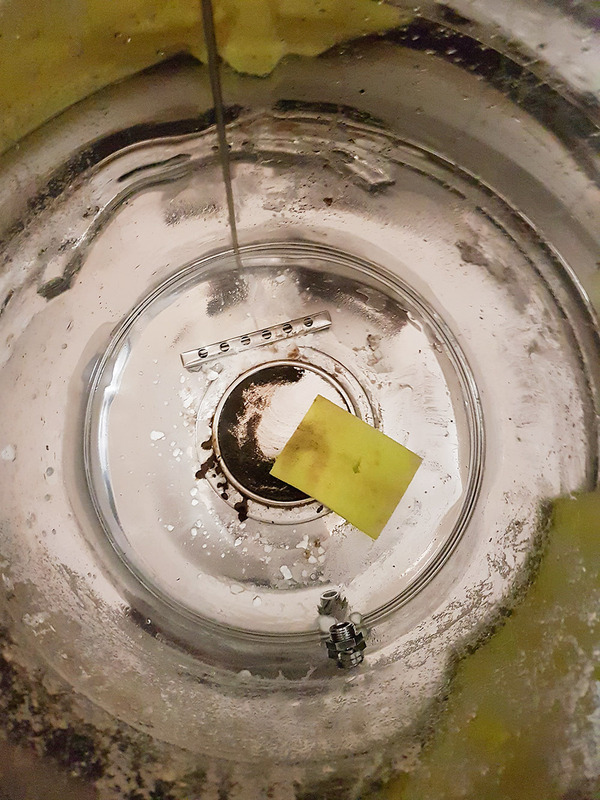 This sediment caked over the temperature sensor and over the heating element. The result was that the temperature sensor read too high, causing the boiler to switch off at well below boiling temperatures I needed. An additional result was that the heating element cover was coated with burned sediment. I only learned that this was what was going on after an hour of angst, well after I was due to remove my grains and start the boil. 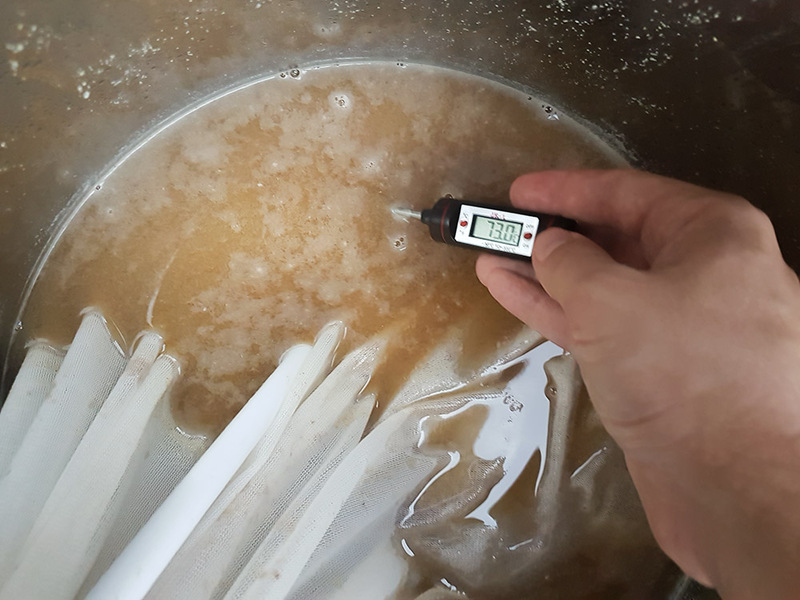 Heating the wort to the right rest temperature. The beer is brewed in two stages. You steep your grains for an hour or so at a certain temperature, to extract all the starches and convert them to sugars. Then you lift out your grain bag, rinse any sugars off those grains and boil the liquid for an hour or so. Boiling brings about a few other reactions and also sterilises everything so you don’t end up with an infected beer. It also provides the right conditions to allow hops to do their work, bittering and flavoring the beer. Instead of steeping for 60 minutes I steeped for several hours, as I wasn’t able to get the temperature high enough to convert sugars properly. This meant I ended up with a lot of burned sediment. I had to pour all the beer out into another container to allow me to clean the heating element, which meant the beer was also aerated. This tends to cause a cardboardy flavour to develop in the beer. I assumed then that what I’d end up with would be a beer that tasted of burned cardboard, hence a Factory Fire Ale. As it turned out, once it was done and fermented the beer actually tasted pretty good. That or my sense of taste is just very undeveloped. Probably the latter. For my own reference, and to give an impression of how epic and depressing this brew session was, timeline is attached below. it didn’t help that I followed a complex process for brewing which involves several “rests” at different temperatures. These steps are almost definitely unnecessary in hindsight. Flour burns base of urn and temperature doesn’t rise. I don’t learn this until emptying later on. later wrapped the urn in a towel to insulate from night air. Temperature rose more rapidly then. 12:00PM Placed fermenter into insulation box with ice pack. Time on heat was 4h 15min. Should have been 2h. I primed with table sugar and stored the bottles for two weeks. It took longer to carbonate than drops, leading me to think it wasn’t working. But eventually they all came good. The beer actually tasted pretty good, though sweet, perhaps from unfermented table sugar? Perhaps from sugars developing that couldn’t be broken down? I dunno. It tasted nice anyhow. She’ll probably be right even if you do burn it. Doing a complex step mash process probably isn’t the way to go right now, given how much I’m stuffing up. Bottle tree to keep space clear while cleaning and drying homebrew bottles. bottle rinser to speed up the process. So this is the first all grain beer I made with my own list of ingredients, buts its a SMaSH so thats not a great feat. 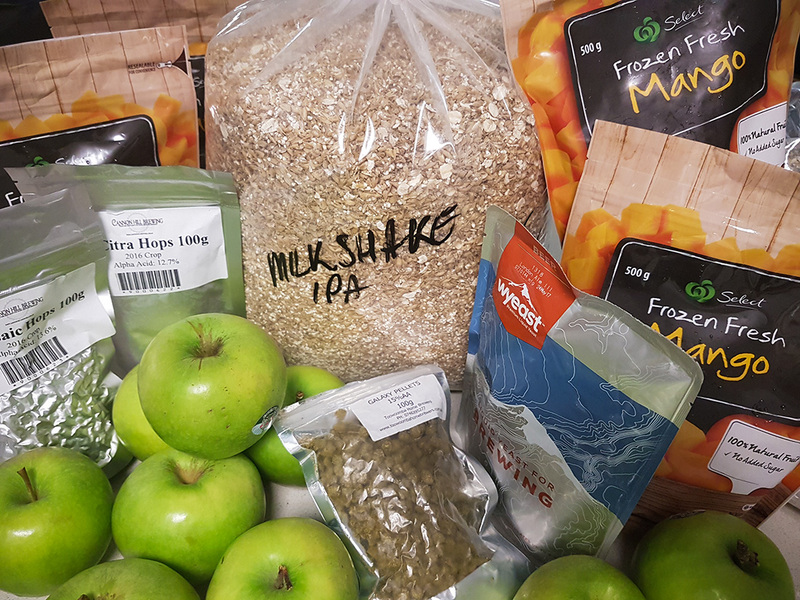 SMaSH stands for Single Malt and Single Hop. 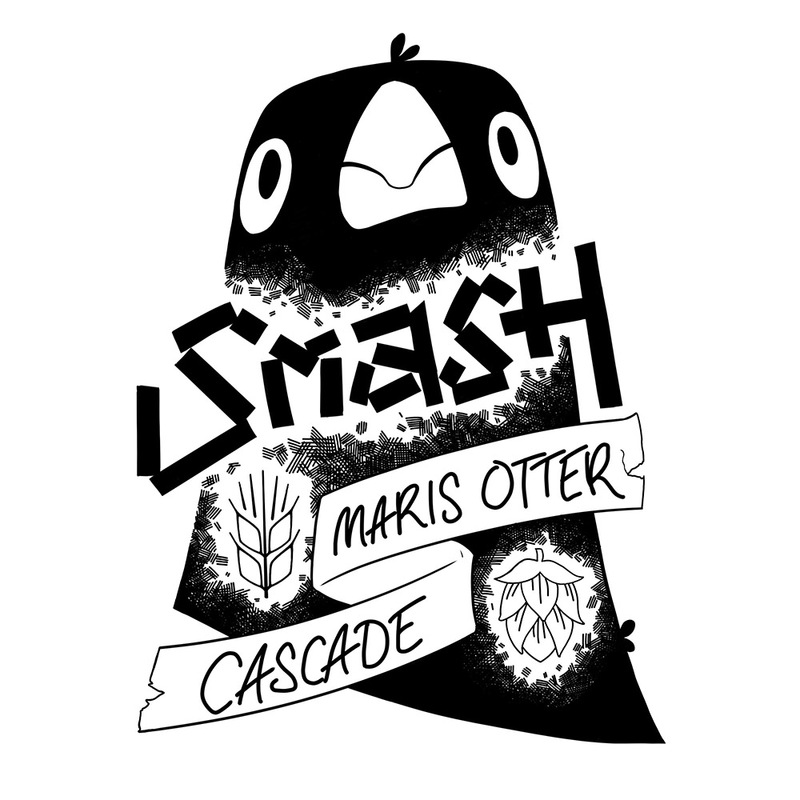 You generally make SMaSH beers to compare base ingredients and figure out what you like and what does what. 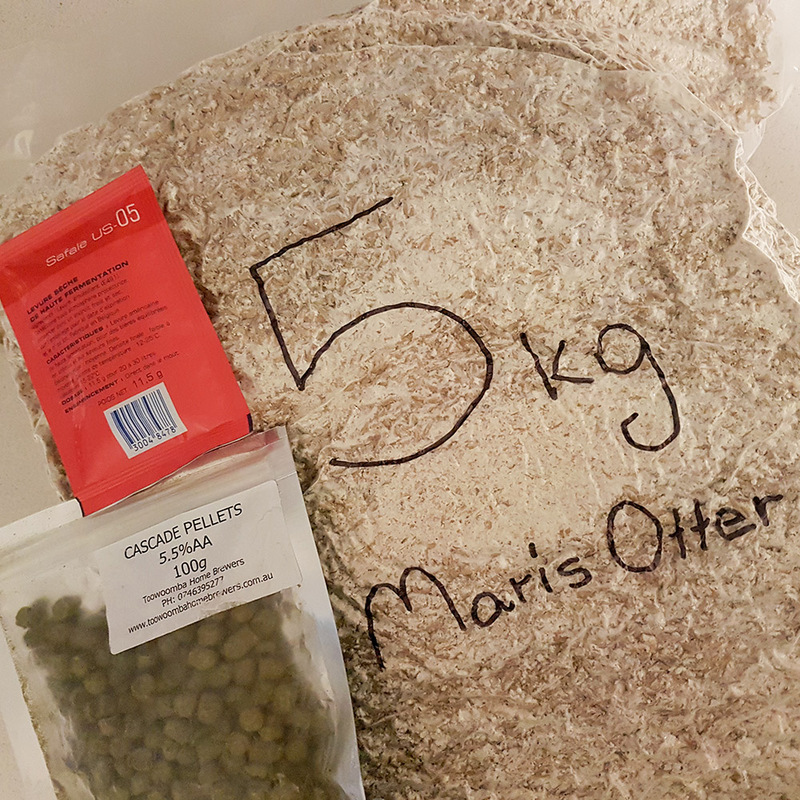 I went with Maris Otter, a really common base malt, and Cascade, probably the most popular hop in use, figuring this would make something easy to drink while also achieving the aim of being a little experimental. It turned out great! I avoided leaving sediment at the base of the boiler by removing the strainer early on. I crafted a little metal hook to lift it out. A little fiddly but it did the job. I was able to hit temperatures at a fairly efficient pace. I wasn’t doing a step mash process, meaning I wasn’t constantly changing the target temperature. This made things a lot easier. A doodle I made up for the label. I didn’t buy enough hops to dry hop. Hops added early in the boil add bitterness and later in the boil they add flavour. Dry hopping is when you add hops during later fermentation, which imparts aroma. I didn’t have enough for this step, and hence there was not much aroma and it was harder to really pick up on the Cascade specific flavour qualities. Bit sad. The beer was good though! Buy more hops I guess. A sheet of stickers to create lino-cut printed labels. I thought I was buying white. Turns out I was buying day glow yellow. This was the first time adapting a recipe with any complexity. I picked the clone of a popular American IPA as it was one of the most popular listed on Brewtoad. Brewing was fairly straight forward, with a lot of hop being added in, including 51g of Citra just for dry hops. I tried using a range of sugars to prime and test effectiveness, including table sugar, brown sugar, drops and dextrose powder. I think in future I’ll just go with the drops. They’re not expensive really and they ferment quickly and predictably. It fermented all the way out and was dangerously high in alcohol but tasted fantastic. Not sure whether it was the combination of hops or that I got to drink it so fresh but it was great! Probably re-evaluate how much malt you need. Jesus dude. or don’t because it tasted great. A simple one, with no hassles. This was a liquid wort kit i just fermented. I was just looking to add some more diversity to the beer we had available and felt like something malty after so many hoppy ales. I fermented it with a smash pack yeast and it tasted good! Nothing ventured here so nothing gained. Except nice beer. So many tasty ingredients. So much ginger! I dont think I changed anything here. This was an expensive disaster. 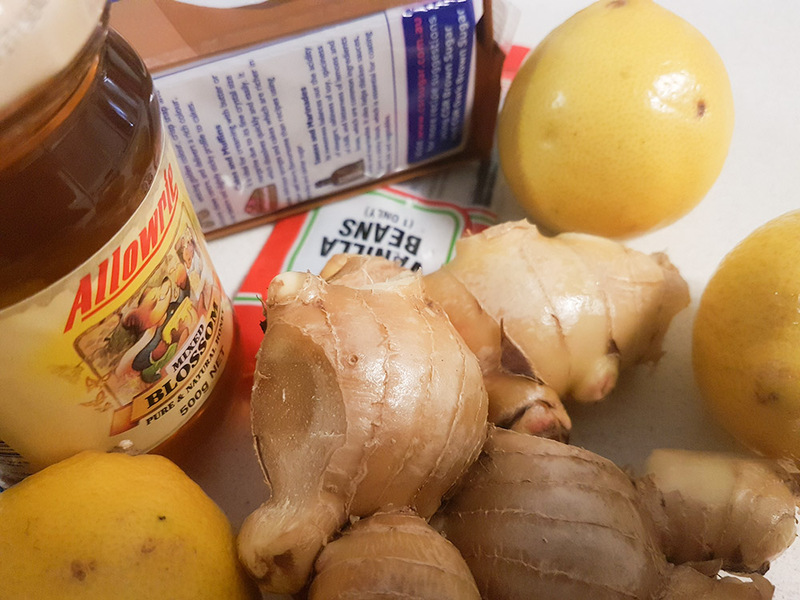 Recipes are strangely hard to find, as it seems most people either use kits to make their ginger beer, or make non-alcoholic ginger beer where the yeast is only used to add a little carbonation in the bottle. I had to combine what looked like winning aspects of different recipes to come up with something serviceable as a recipe and process. 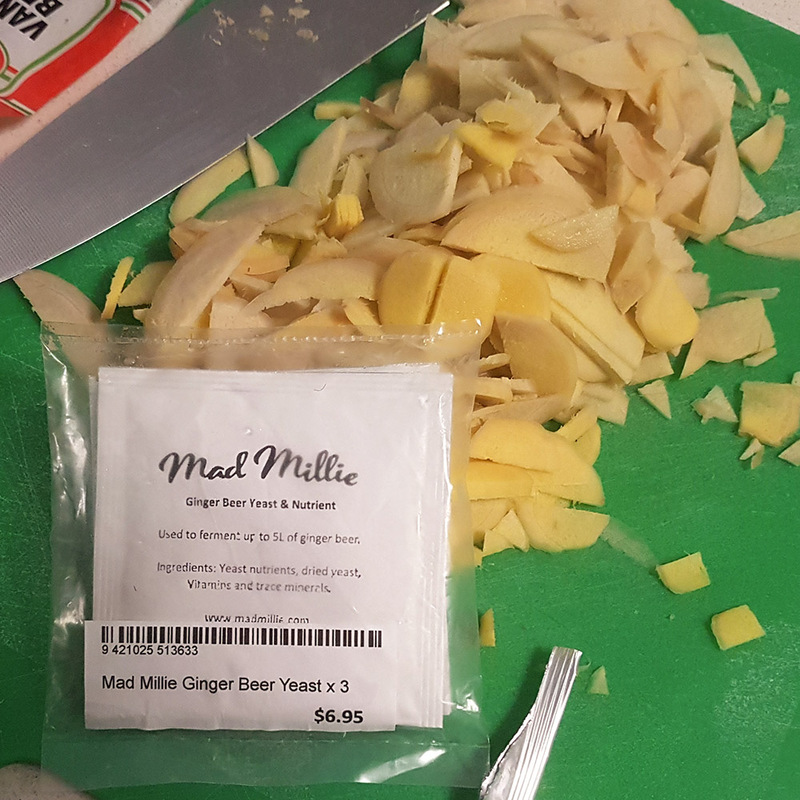 So much money spent on fresh ginger and other ingredients lead to a wort that smelled and tasted absolutely amazing. 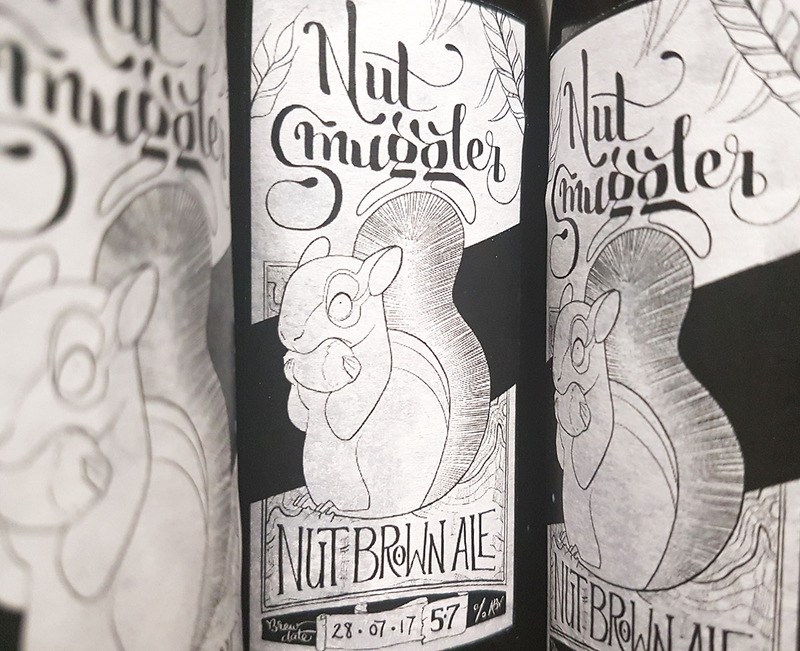 Fermentation killed all flavour and sweetness, leaving only a faint gingery aroma and a strong alcoholic taste. I tipped it all out and kept a few bottles to see if it improved with age, but noooooope. I made a small batch at least at around 10L or so. Was able to cook it all up on the stovetop so brewing was nice and relaxed. I used a specialised yeast for this. I don’t know why it went so wrong. 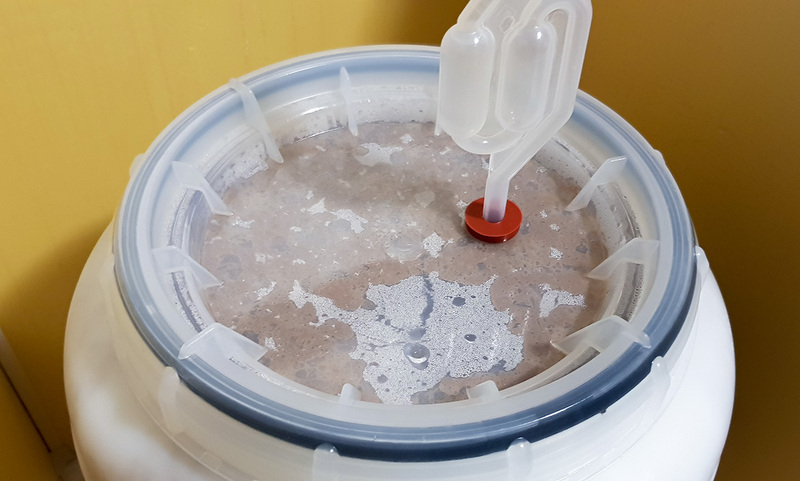 Look into ending fermentation early somehow, whether with a chemical addition or a yeast that ends earlier. Even doing this may not save the flavour though. maybe Kill the yeast then add more wort? Look into what a more appropriate recipe might be. Either the ingredients or the steps are clearly really wrong. This beer was great! it was an all grain recipe that I adapted from a few popular ones online. I kept the spent grains after brewing with them and dried as much of them as I could, before blending them to a finer consistency. 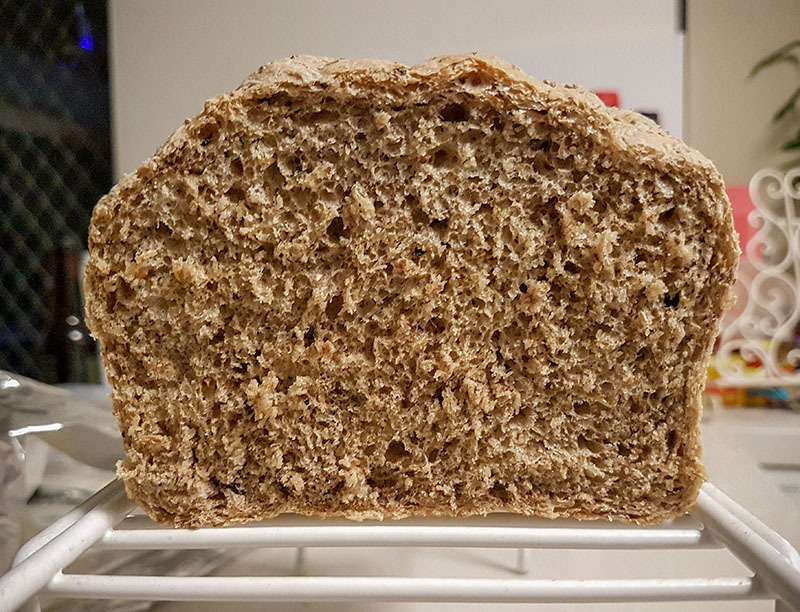 I was able to add it to bread at around one part to three parts white flour, making a sweet, dense loaf that was pretty lovely, albeit a bit crumbly. The beer itself was excellent. My favourite so far! Super malty and not very hoppy or bitter. I’m not sure why I fixated so much on Pale Ales to start with. I decided I should make more of these. I used this recipe again for a keg for my Aunty’s wedding the following year. Keep the grain! Its delicious! No real upgrade on this one, from memory. It was all about adding new ingredients and trying new things. One of the reasons I wanted to start working on homebrew was that there’s a style of beer, called a New England IPA (or NEIPA) which I wasn’t able to find anywhere locally. Its a hoppy, fruity, cloudy beer that looks like orange juice and sounds delicious. This batch was my attempt to replicate the style. It had a handful of extra ingredients and steps. To add additional mouthfeel and cloudiness to the beer, you add pureed apples to the boil, which brings pectin for body and cloudiness. Lactose is added as well. Lactose is a form of sugar that the yeast cannot consume. This means that at the end of fermentation, the beer retains more sweetness. Mangos and hops were also added together late in fermentation for flavour and aroma. The result was super duper tasty after being left for three or so weeks to carbonate and settle. Looked just like orange juice, with a lovely fruity taste exploding with hop flavour. One thing I did not consider was how it would change over time. I had imagined that all fruit additions would be preserved by the brewing and fermentation process, however after a month or two, the beer had turned brown, with a turbid trub at the bottom of each bottle that was stirred up by carbonation when the bottle was opened, creating a sort of sludgey lava lamp as soon as a bottle was opened. It didn’t taste as gross as all that, but the flavour did change over time and when I opened my last bottle of this in five or so months time, I just poured it out. So all in all, a project that was well worth the effort, but which I should probably make as a perishable to share at parties or as gifts in future. Prior to this batch, Matt and I went for our first big trip together to visit the USA for a month. Upon returning home felt a little listless. I’d been wanting to make this upgrade for a while, and decided before I went that this would probably be a worthwhile upgrade given how much I’d done so far without losing interest in brewing. The main event with this batch was that it was going in a keg rather than bottles! So much less work involved with cleaning. With bottling, you need to clean about 30 bottles for every brew you make. Each bottle needs to be rinsed, scrubbed, sanitised, re-rinsed, sterilised and dried before its ready to go again. With kegging, you do all these steps for one keg, then carbonate and go. Much nicer. 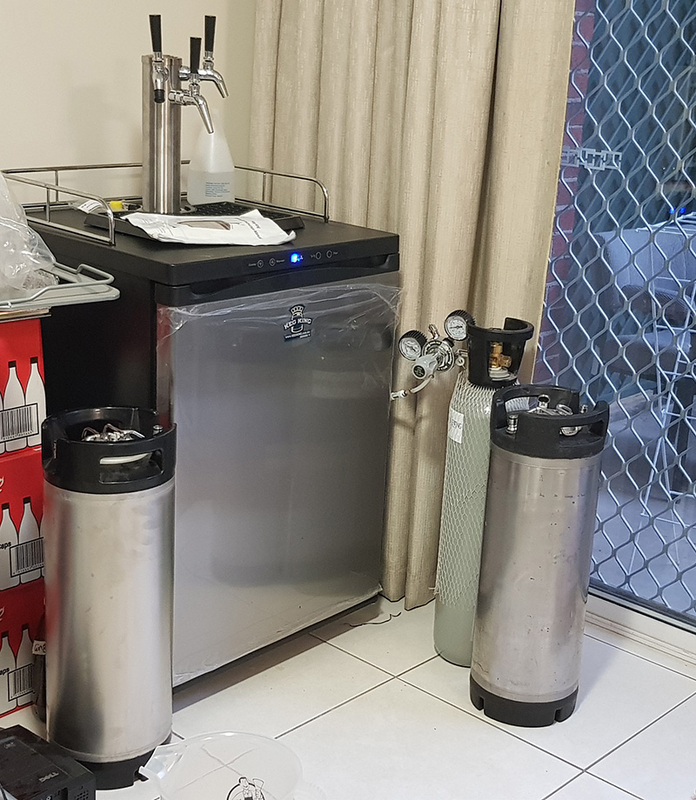 So we got a kegerator (keg refridgerator) and some kegs and a CO2 cylinder and set that up to use instead! Setting up the kegerator took longer than it should have, owing to a few parts either missing or not being quite fit for purpose. 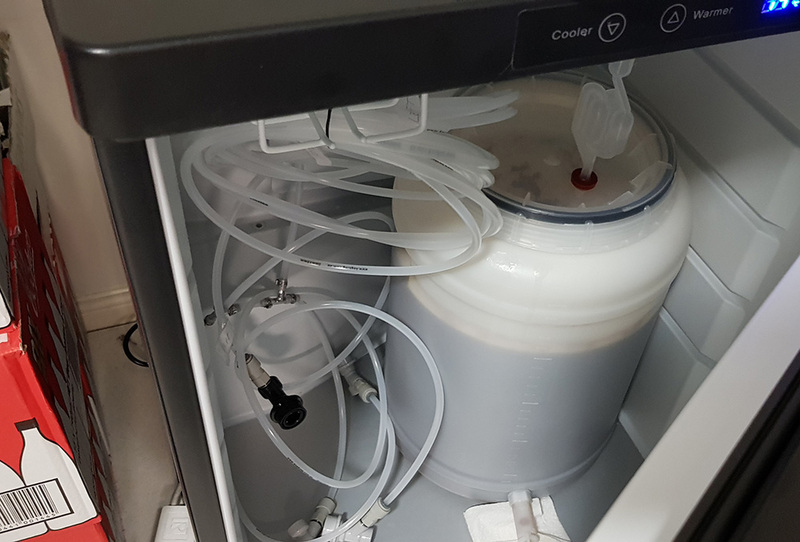 Once it was set up, I was able to use the temperature control to use the fridge as a fermentation chamber. I fermented both this beer and a Smokey Porter at the same time, with the pale ale in the fridge and the smokey porter in the esky with the tilt to monitor temperature. Both were fermented with Nottingham Ale yeast. Irish Red Ale filling out a shiney new 19L corny keg! Plenty. None are that interesting. We ran out of the Irish Red Ale on tap, so I bought this as a replacement refreshing staple ale. I decided to ferment three beers to stock up the kegs, buying an additional one. It seems the pressure release valve is leaky, so we’ll have to go back to the shop to exchange it. I’m thinking I might just go with a new keg so I don’t have to worry about dings and faults. A brick of DME which took a good ten minutes to break up for yeast food. This is supposed to be a powder. New fermenter in case this batch infects the old one. Otherwise it will become a secondary. This is a low gravity beer. This means its not very strong before fermentation. It also doesn’t ferment out as much as other beers too, meaning it has a much lower alcohol content, which is kind of a nice prospect to be honest given how strong everything else I brew tends to turn out. I brewed it in the smaller of the two fermenters I had, using a starter made over 24 hours with US-05 yeast to help it take hold. 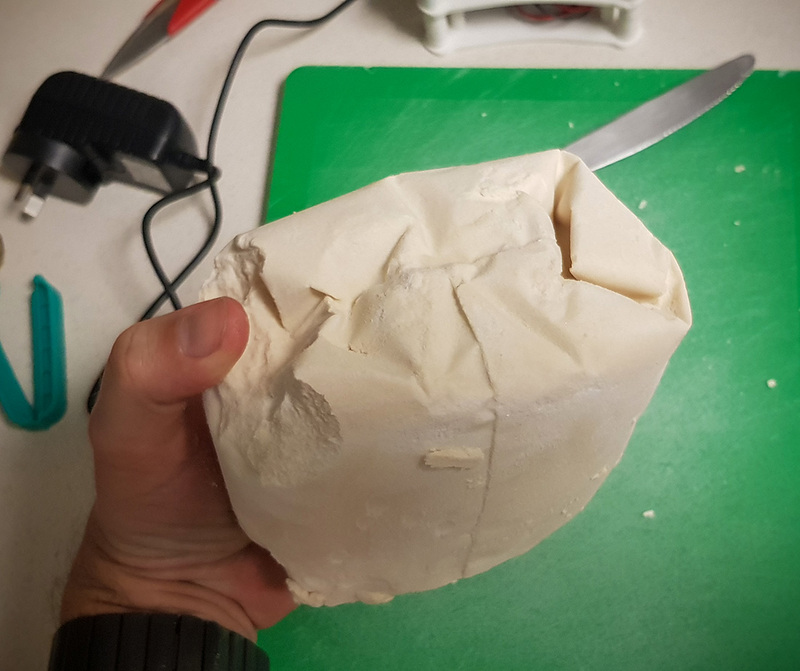 Moisture had leaked over time into the bag of dried malt extract that I wanted to use for the starter, turning it into a brick, so I had to cut off chunks of it with a serrated knife. That sucked. I’ll look to buy some more at some stage and keep it in an airtight container with some desiccant. 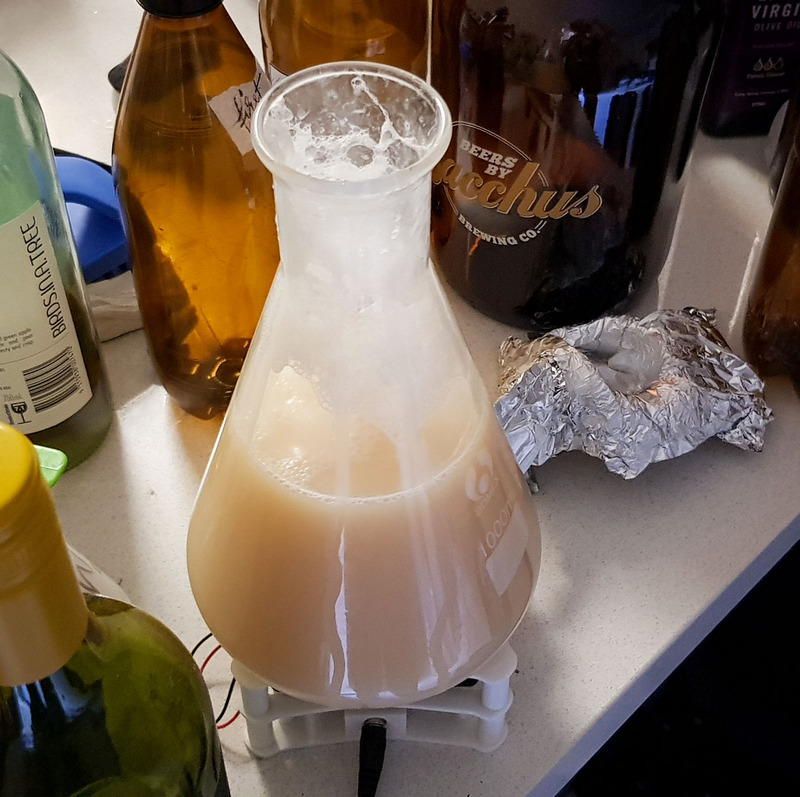 The resulting yeast starter, once I’d smashed off enough of the DME to make it up. Fermentation produced enough krausen to coat the roof of the fermenter and go up into the airlock which is a little worrying. Almost needed a blowoff instead of an airlock. The brew smelled a little estery when bottling, but tasted fantastic. After it had carbed up, this smell was prettymuch gone and it tasted amazing. I bottled these, with the thought that they’ll be better for sharing with others, and a sour isn’t something we’ll look to drink a few times a week on tap. This will leave the taps free to share between an ale, a porter/stout and something novel but refreshing like maybe a ginger beer. I’d thought to prepare some fruit syrups with our blender for this batch. Berlinner Weisse is traditionally served as a desert, mixed with syrups. While I didn’t get around to this, I did try it with grenadine a few times which was really, really lovely. More of a pink sherbet drink than a beer. I’m not sure whether its just the novelty that has drawn me to this style, but depending on how things go, perhaps I should try to make one from scratch next time. Krausen touching the lid of the fermenter. Thats about it for year one! I think I have the broad stroked figured out. Whats left is to improve my recipes and diversify into making a few more styles from scratch. 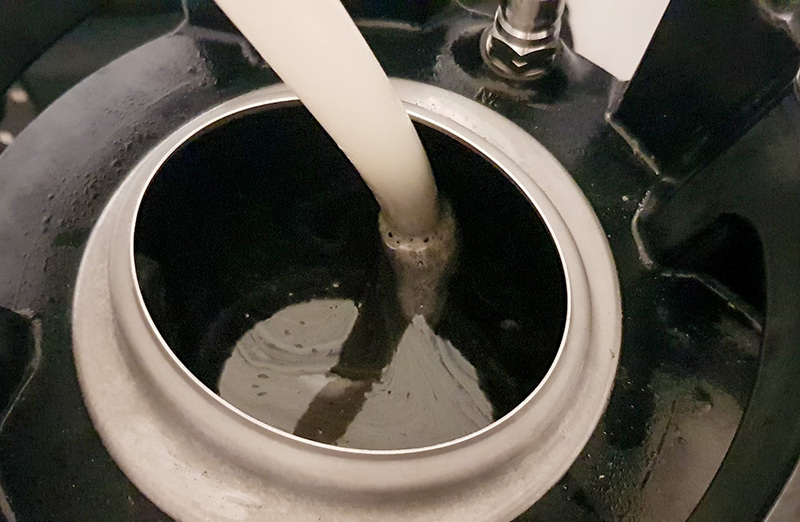 Lagers require precice control of water chemistry, Sours require a whole extra step involving bacteria that would be fun to try. Saisons are something I’d love to explore and have no idea of the inner workings of. Stuff for later!